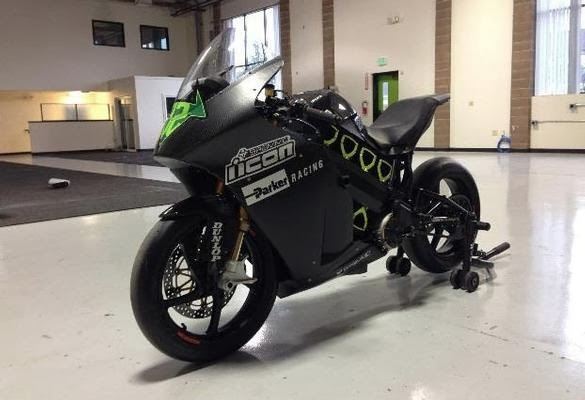 Darvill Racing has announced (on Friday) a historic agreement in which they will be the first electrically powered motorcycle racing team to compete directly against gasoline powered bikes in a regular road race. They'll be competing in the "Southern 100 Road Races" which is an ACU/FIM sanctioned event held on the south end of the Isle of Man, in July every year. The TT Week, which includes the TT ZERO, is held on the northern end of the island, in June. They claim this is a first for any electric motorcycle team to compete directly against gas bikes in their own turf. This is a big claim, and I'll go over the details in a minute. The key is that the Southern 100 is sanctioned by the ACU, which in turned is sanctioned by the FIM, making this the first appearance of electric bikes at an FIM sanctioned gas bike event. Or, as team Principal Alex Aitchison wrote to me, "What we have been able to secure for the first time is a sanctioned (international) mixed race on a pure road racing circuit (Billown)." The agreement was reached between Darvill, the ACU (Great Britain's motorcycle racing association), and the Southern 100. Additionally, Darvill will be competing in an aggressive schedule of racing: "Competing in the Pre-TT, TT, Southern 100, Classic TT, Manx Grand Prix, ThundersportGB and Andreas Championships. We have committed to a number of international races and have some individual and diverse one-off events planned." In December, an agreement between Brammo and Darvill was announced where Darvill would be a "Factory Supported Team" racing in the FIM eRoadRacing series using a pair of Empulse TTX's. One will be a stock Empulse TTX, and the other will have some modifications. At the time they hinted at other racing events in addition to the eRoadRacing series. UPDATE Darvill's press release didn't make it crystal clear which of these were electric or gas - I've updated it after getting clarification. Let's get back to this claim that Darvill Racing will be "the first team to complete in a pure road race alongside conventional ICE (Internal Combustion Engines) anywhere in the world." An astute reader might remember - Chip Yates - Team Moto-Electra - Lightning Motorcycle - Brammo in the AFM during 2013 - and start scratching their head, and questioning whether Darvill is telling the truth. What this boils down to is race length. and FIM sanctioning. The club racing that Chip Yates, Team Electra and Brammo have done in earlier years meant for short races - about 6 laps, or much less than 20 miles race length. The Pikes Peak event is, if I recall right, 12 miles long, but it's all uphill (of course). The TTXGP and eRoadRacing events have been 20-25 mile length events. The TT ZERO is a 37.33 mile racing event. Typical professional level gas bike races are about 60 miles length, or more. The Southern 100 event is somewhere in-between. Going over the 2013 Southern 100 race results, I see the races cover 6, 7 and even 8 laps, at 4.25 miles per lap. Hence, it's a nearly 35 mile race, which is longer than the typical TTXGP/eRoadRacing event, but shorter than the pro level gas bike races I've seen (AMA Superbike). Darvill worded this very carefully, distinguishing the Southern 100 event from earlier instances of electric bikes racing against gas bikes. The club races that Chip Yates, Team Electra and Brammo entered previously aren't in the same league, nor race length. I wonder how they're drawing the distinction in the case of Lightning Motorcycle's win at Pikes Peak last summer. Lightning was entered in the electric class, but did come away with the overall win, by a big margin. The real differentiation is that the Southern 100 is sanctioned by the FIM, which is not true for any of those other events. Alex Aitchison – Darvill Racing Team Principal: “We are extremely pleased to be given the opportunity to be the first team to compete with ICE machines in a pure road race event anywhere in the world. We are looking forward to working with the ACU and Southern 100 club. Spending time with Gary (Thompson) and his team it is evident that the ACU are committed to being the leading light in the field. Gary Thompson – ACU General Secretary and Clerk of the Course for the Isle of Man TT: “We are extremely pleased to be working with Darvill Racing – a brand that is synonymous with success, passion for racing, and the development of innovative and cutting edge machinery. Electric Vehicles are now at an advanced enough stage that they can compete with conventional technologies and we are proud to be in a position to support the inclusion of the first mixed race on Roads anywhere in the world. It is truly an exciting time for motorcycle racing.